GRETNA, Louisiana (CelebrityAccess) — Frankie Ford, a singer who is best known for his 1959 hit "Sea Cruise," died in Gretna, Louisiana on September 28th. He was 76. The New York Times reported that Mike Shepherd, executive director of the Louisiana Music Hall of Fame of which Ford was a member, said that Ford had been ill for some time and was unable to walk after being struck by a car in Memphis several years ago. Born Vincent Francis Guzzo, Jr. in Gretna, Louisiana in 1939, first found national fame when he started recording for Ace Records where he was produced by Johnny Vincent. 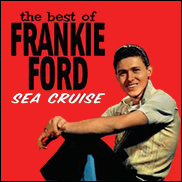 Ford toured widely in the US on the strength of his first hit, "Sea Cruise," which charted at #14 on the pop chart and #11 on the R&B charts. However, Ford failed to achieve the same level of success with follow-up singles such as "Time After Time." In 1960, he moved to Imperial Records, where he recorded singles such as "Dog House" and "Saturday Night Fish Fry" with "Seventeen" being his final charting single. He later was drafted and entertained troops for the army in Vietnam and Japan.